Will the PHEV be the Smart Grid’s “killer app,” the outward expression of the Smart Grid that consumers adopt en masse as they did e-mail? There are plenty of experts who think so. The sale of 800,000 plug-in vehicles during the next five years could create a whole mess of challenges for utilities, automakers and consumers, but smart energy companies have a shot at building new businesses to help ease the pain of that influx. 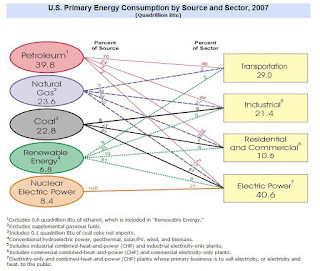 US Primary Energy Consumption by Source and Sector. We use the equivalent to all our imported oil—for transport. It's hard to know which is worse: the huge transfer of wealth to oil-producing countries, the national security risks of that dependence, or the greenhouse gas emissions from our low-efficiency internal combustion engines. Plug-in hybrid electric vehicles are not part of the Smart Grid. Rather, the Smart Grid encompasses the technology that will enable us to integrate, interface with and intelligently control these innovations. The electricity grid was not designed, and does not operate presently, as an aspect of the transportation system. It is one thing to sprinkle a modest number of electric-drive cars throughout a nation as large as the United States; it is quite another for even a seemingly small number of those cars to operate simultaneously in a specific area, let alone for millions to be densely concentrated in a single city. These DOE estimates may be aggressive. There weren't 15,000 Volts and 25,000 LEAFs in 2011. Domestic markets for plug-in hybrid and electric vehicles are likely to be buoyed by a consumer tax credit worth up to $7,500 per vehicle (depending on the size of the vehicle battery). This credit begins to phase out for vehicles produced by a given manufacturer once that manufacturer has sold 200,000 qualifying vehicles in the United States. Demand for plug-in and electric vehicles is also supported by increasing federal fuel economy standards and several additional state purchase incentives and could be enhanced if oil prices continue to rise in the coming years. However, current costs for plug-in hybrid and electric vehicles are often double that of a comparably sized and equipped conventional vehicle, limiting widespread consumer interest until further cost declines are achieved. Sales of plug-in hybrid and electric vehicles have so far lagged market forecasts, with fewer than 20,000 vehicles sold in 2011, a year that marked the release of several mass-market models , including the Nissan Leaf and Chevy Volt. 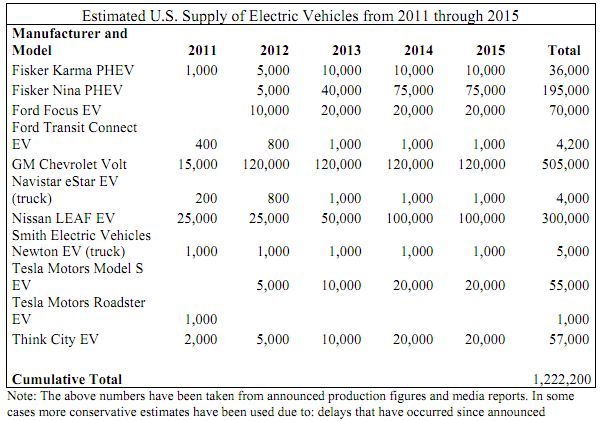 By the end of 2014, plug-in hybrid and electric vehicle sales are likely to total well below 100,000 per year. 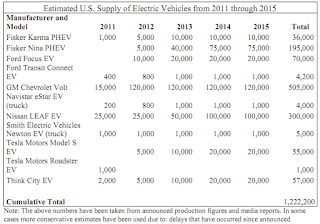 The most optimistic industry analysts project US plug-in hybrid and electric vehicle sales will continue to grow robustly from this small base, albeit to just about 2 percent of projected light vehicle sales by 2017 (or about 360,000 vehicles). EV – Electric Vehicle - A vehicle that uses an electric motor as a means of propulsion, using only batteries as storage. Famous EVs are the Tesla Roadster and the upcoming Mini E.
CAV - Compressed Air Vehicle. Compressed air is pumped into a tank, which is then delivered to a piston engine and through an elaborate heat exchange system. The compressed air expands in the cylinder and drives the pistons. This technology might end up in the Tata Nano cars. E-REV - Extended Range Electric Vehicle - GM’s branding of the series hybrid system for the GM Volt. FCV - Fuel Cell Vehicle - Vehicles using hydrogen as a means of producing electricity when combined with air. The technology is difficult and very, very expensive. As a side note, transporting the equivalent of one gas tank would be the equivalent of 25 hydrogen tank. Since hydrogen has to be cooled off to almost absolute zero, it also uses one third of its energy keeping cold. To complicate things a little more, creating hydrogen uses a lot of energy, usually electricity made most of the time with coal burning power stations and you get the gist, we need to fine a more sustainable way of producing hydrogen. Well look into that more in upcoming posts. Lastly, FCV use 10,000 per square inch hydrogen tanks on-board. The thought of 10,000 psi people driving around cities and neighborhood, they way they currently do is blood curling to some. Building hydrogen dispensing stations is currently around the vicinity of $2 to 3 million. Does that mean hydrogen is hype? Probably not, just decades away from being financial viable. Series Hybrid System - Only the electric motor is the only means of propulsion, relegating the ICE as a generator to recharge the battery pack that feeds the electric motor. The Obama administration has committed $11 billion to bringing the electric car into the mainstream. In a recent speech, the president set a goal of reducing the amount of foreign oil by one-third in a decade. Meanwhile, during his State of the Union Address, he challenged Americans to put 1 million electric cars on the road by 2015. According to the Pacific Northwest National Laboratory, existing U.S. power plants could meet the electricity needs of 73% of the nation’s light vehicles (i.e., cars and small trucks) if the vehicles were replaced by plug-ins that recharged at night. Such a shift would reduce oil consumption by 6.2 million barrels per day, eliminating 52% of current imports. At $6 per Gallon, Electric Vehicles are becoming cost competitive with traditional internal combustion vehicles. Since the cost of electricity is only a couple of hundred dollars a year to operate an electric vehicle, the biggest sensitivity will be the price differential between EV and ICE's. Reduced Greenhouse Gases - Reduction in U.S. carbon dioxide emissions by about 25%. 28% of the U.S. greenhouse gas emissions come from the transportation sector. In California, transportation represents 38% of total greenhouse gas emissions. From a societal perspective, the deployment of PHEVs will lead to CO2 reductions. A joint study conducted in 2007 by EPRI and the Natural Resources Defense Council (NRDC) concluded that PHEVs will lead to a reduction of 3.4 to 10.3 billion metric tons of greenhouse gases by 2050, as a function of PHEV fleet penetration and the carbon-intensity of the electricity generation mix. In the reference year of 2030, this EPRI study indicates that PHEVs will result in annual greenhouse gas reductions of 100 to 300 million metric tons of CO2 per year, based on a range of projected PHEV market share. Since Smart Grid technology makes widespread PHEV deployment possible, it is reasonable to attribute some share of projected PHEV CO2 reduction impact to the development of a Smart Grid. For the purposes of the study, an attribution range of 10% to 20% is applied based on EPRI judgment. On this basis, the CO2 reduction impact of PHEVs that can be attributed to a Smart Grid is 10 to 60 million metric tons of CO2 in 2030. Improved Urban Air Quality - Reductions in emissions of urban air pollutants of 40 percent to 90 percent. All emissions in urban areas are expected to improve because of the shifting of the emission source from millions of individual vehicles in population centers to central generation plants that are traditionally located away from population centers. Reduced Vehicle Operating Costs - Assuming customer acceptance regarding price, performance and longevity, these vehicles offer consumers the opportunity to shift use of oil and gasoline to electricity – and to power a car for the equivalent of $.90 per gallon. 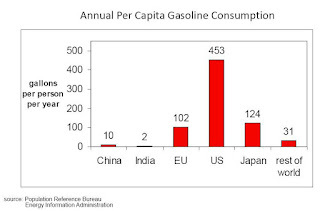 American households spent an average of $3,597 on gasoline in 2008. Between 2001 and 2008, theaverage retail price of gasoline increased from $1.46 to $3.27, costing typical households $1,990 a year in increased fuel expenses. By way of comparison, all changes to the federal tax code during that same period decreased annual federal income and estate taxes by about $1,900 for the median household. In other words, every penny that the typical household saved due to federal income and estate tax cuts over the past eight years was spent on higher gasoline bills. The fundamental factors that contribute to the increasing—and increasingly volatile—price of oil are likely to persist over the long term. Between 2007 and 2030, the International Energy Agency expects world oil demand to grow by 21.2 million barrels per day, with fully 100 percent of the increase coming from developing countries. Rising demand for energy in China and India in particular has added a new dimension to the global oil consumption picture. With burgeoning middle classes and rapidly expanding economies, both nations appear poised to provide consistent pressure on world oil suppliers. National Security - Displacement of about half of our nation's net oil imports. Relying more on electricity for transportation and less on fossil fuels increases our energy independence a well as our environmental prospects. A shift from gasoline to PHEVs could reduce the gasoline consumption by 6.5 million barrels per day, which is equivalent to 52% of the U.S. petroleum imports. Much of the infrastructure that delivers oil to the world market each day is exposed and vulnerable to attack in unstable regions of the world. To mitigate this risk, U.S. armed forces expend enormous resources patrolling oil transit routes and protecting chronically vulnerable infrastructure in hostile corners of the globe. This engagement benefits all nations, but comes primarily at the expense of theAmerican military and ultimately the American taxpayer. A 2009 study by the RAND Corporation placed the cost of this defense burden at between $67.5 billion and $83 billion annually. Electricity is Diverse and Domestic. Electricity is generated from a diverse set of largely domestic fuels. An electricity-powered transportation system, therefore, is one in which an interruption of the supply of one fuel can be made up for by others. Electricity Prices are Stable. Electricity prices are significantly less volatile than oil or gasoline prices. Since 1983, the average retail price of electricity delivered in the United States has risen by an average of less than 2 percent per year in nominal terms and has actually fallen in real terms. The Power Sector has Substantial Spare Capacity - The U.S. electric power sector is constructed to be able to meet peak demand. However, throughout most of a 24-hour day—particularly at night—consumers require significantly less electricity than the system is capable of delivering. Therefore, the U.S. electric power sector has substantial spare capacity that could be used to power electric vehicles. The Network of Infrastructure Already Exists - Unlike many proposed alternatives to petroleumbased fuels, the nation already has a ubiquitous network of electricity infrastructure. No doubt, electrification will require the deployment of charging infrastructure, additional functionality, and increased investment in grid reliability, but the power sector’s infrastructural backbone—generation, transmission, and distribution—is already in place. 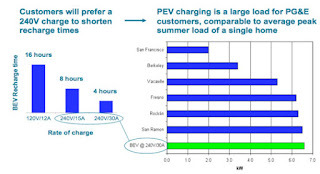 Flatter Load-duration Curve - PHEVs take advantage of lower cost and off-peak capacity and can provide grid support during the peak periods. The mix of future power plant types and technologies may change as a result of the flatter load-duration curve favoring more base-load power plants and intermittent renewable energy resources and disfavoring expensive peaker plants. Local Delivery Vehicles and Minibuses - Have duty cycles that comprise frequent stop/start operation. This is ideally suited to EV operation. Manufactured in very low volumes, the investment for these vehicles is small by comparison with the major VMs, but all of the companies in this market struggle to finance product development and to source components economically. Demand in this market currently exceeds supply, and with encouragement, this sector has the potential to grow significantly and is an ideal first niche for wider EV adoption. The larger vehicles have plenty of room for batteries and, and they’re the gas-gulpers. 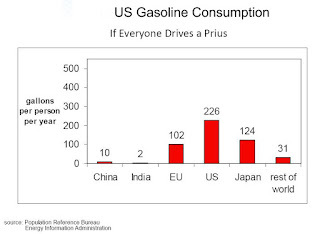 IF you switch around the usual way of looking at miles per gallon into gallons per mile, this becomes obvious. Our 50 MPG Priuses converted to 100 MPG PHEVS use 1 gallon per hundred miles instead of 2–saving 1 gallon. A 15 MPG truck that becomes a 45 MPG PHEV saves over 5 gallons per hundred miles. Plugging into a Lump of Coal - in the foreseeable term, China/India and even the US will be using coal to produce the majority of electricity for years to come. And though renewable electricity from wind and solar is a good goal for these cars, it will likely be much more costly (about 5X higher currently in India where a new coal plant costs 4c/KWh) It is true that coal will be used to create electricity for some time to come, but even on today’s national grid (50% coal), an electric mile produces only half the CO2 of a gasoline mile. Particulates and SOX emissions would increase if gasoline vehicles switched to electricity as a result of increased dispatch of coal-fired power plants. There are regional differences that depend upon the mix of coal and natural-gas-fired power plants. Competition from Natural Gas - Increases in natural gas-fired vehicles and fleets pose a competitive threat to the widely anticipated growth in electric vehicles. And liquefied gas is the undisputed favored choice for clean fuel heavy transportation options. Power – The BMW Mini e does fine in mid-range acceleration, but from a standstill is slowish off the mark, acceleration through to 63 mph in a time of 8.5 second. On the other hand, electric motors produce loads of torque instantly; the Volt’s motor delivers impressive 273 pound feet at 1 rpm. Although the batteries add a lot of mass, that mass is concentrated low in the car which aids handling. Range – The GM Volt battery should deliver 40 miles of all-electric range, a distance GM targeted because the company’s research shows that 80% of U.S. drivers commute 40 miles or less each day. Plug the car into a 220-volt outlet – the same kind your dryer uses – and you’re ready to go in less than three hours. Battery Cost – Some say they are not selling the BMW Mini e to the general public because the batteries are not yet affordable. Some companies are planning to allow you to lease the batteries alone (TH!NK). But nobody will actually just sell you the car, because it would cost $50k if they actually passed along the battery cost. Impact to Electric Grid - Pervasive deployment of distribution connected PEV affects distribution planning, upgrades, operation and protection dramatically. These impacts will be even greater if consumers charge up their cars during peak hours. Inflated Expectations - Bureaucratic claims that electric cars are three to four times more efficient (measured in kWh/km) are exaggerated, he explains, because they don't take into account inefficiencies in distribution. Only 36 per cent of energy available in the fuel in a power station is delivered as electricity - so the green "efficiency" advantage disappears. But even if all the available energy was delivered, without loss, the carbon emission saving would be negligible. And it's only "cheaper" because petrol is so heavily taxed. Higher system loading could impact the overall system reliability as the entire infrastructure is utilized near its maximum capability for long periods. “Smart” PHEV charging systems that recognize grid emergencies could mitigate the extent and severity of grid emergencies. Near maximum utilization of the nation’s power plants is likely to impact wholesale electricity markets. MPG - What happens to fuel-economy ratings — will they need to be revised or rethought? Recharges in 7 hours at 200 volts / 15 amps. It takes twice that long at 100 volts. Remember, this is Japan, so the voltages are different. Maximum output from the permanent magnet synchronous motor is 47 kilowatts (63 horsepower). It is pushing a car that weighs almost 2,500 pounds. But with 132 foot-pounds of torque, the car we has decent pull and feels quicker than the numbers suggest. Launched for fleet customers in Japan in July 2009, and on April 2010, for the wider public. Retail sales began in the Japanese market at a price of ¥3,980,000 (~US$43,000). The electric car is eligible for government subsidies of ¥1,140,000, thus reducing the price to customers to ¥2,840,000 (~US$30,700). Sales in Australia began in July 2010 via leasing. Production had reached 5,000 units by the end of November 2010. Launched in Germany in December 2010 at a price of €34,990 (~US$51,000). Sales in the U.K. began in January 2011 at a price of £28,990 (~US$45,100) before the GB£5,000 Plug-in Car Grant that went into effect in January 2011. U.S. sales are scheduled to begin in January 2012 with a base price of US$27,990, prior to the federal tax credit and other incentives available in California and other states. 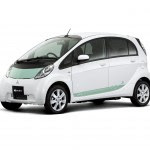 The Leaf's retail price in Japan starts at ¥3.76 million and US$32,780 in the United States. A federal tax credit of $7,500 brings the effective price down to $25,280. And if you add in state tax incentives, such as the $5,000 incentive in California, the effective price dips below $20,000. Leasing plans begin at $349 a month. The price in the United Kingdom is £28,350 and around €35,000 in the other three European countries where it will be launched first. . Most countries have applicable tax incentives or subsidies for eligible buyers that reduce the effective cost of purchase below the retail prices listed by Nissan. Deliveries to individual customers began in the United States and Japan in December 2010, in Ireland in February 2011, the U.K. in March, the Netherlands in June with global market availability planned for 2012. According to Nissan initial availability is limited in quantities and to select markets and only for customers who made online reservations. The availability will be increased by the second quarter of 2011 with U.S. production planned for 2012. Reportedly using a 24 kWh lithium manganese battery pack with 192 cells. On a standard circuit (220 V) the charge time is supposed to be four hours (though some news reports say 8 hours). A full charge on a 240V circuit should take 3-4 hours although it will be possible to do a quick 80 percent charge from a high current circuit in about 25 minutes. The battery management system will allow the battery to be quick charged only up to 80 percent and then slow down the charge rate. This is being done to prevent over-charging and damaging the battery. . The US Department of Energy initially granted US$99.8 million, and later awarded an additional US$15 million, to Ecotality for the EV Project, that involves the installation of up to 11,210 charging stations in strategic markets in Phoenix and Tucson, Arizona; San Diego, California; Portland, Eugene, Salem and Corvallis, Oregon, Seattle, Washington; Nashville, Knoxville, and Chattanooga, Tennessee; Washington D.C.; Dallas, Fort Worth, and Houston, Texas. Nissan has partnered with Ecotality on this project and will supply 4,700 vehicles to individual and fleet customers in these areas. The Volt has been on sale in the U.S. market since mid-December 2010, and is the most fuel-efficient car with an internal combustion engine sold in the United States, as rated by the United States Environmental Protection Agency (EPA). According to General Motors the Volt can travel 25 to 50 miles on its lithium-ion battery. The EPA official all-electric range averaged 35 miles and the total range is 379 miles. The EPA rated the Volt's combined city/highway fuel economy at 93 miles per gallon gasoline equivalent (MPG-e) in all-electric mode, and at 37 mpg in gasoline-only mode, for an overall combined gas-electric fuel economy rating of 60 mpg. Initially the Volt is being sold only in seven markets ( California, Washington Metropolitan Area, Michigan, Texas, New York, New Jersey and Connecticut.). Nationwide availability in the U.S. is expected to begin in late 2011. The 2012 Volt will be available in Canada in the third quarter of 2011, and the suggested retail price starts at CAD 41,545 (US$43,568) which excludes any charges, fees, optional equipment, and before any available subsidies or incentives for qualifying buyers. Because of higher than expected initial demand, 2011 production will be increased to 25,000 units and GM will likely build to the maximum capacity of 60,000 in 2012. The Volt’s main competition, the Nissan Leaf, forgoes the additional combustion engine — and ends up costing $8,000 less as a result. The motor produces 150 kilowatts (about 201 horsepower), but the car weighs 3,230 pounds. Rear seats have been lost to make way for the car’s 5,088-cell lithium-ion battery technology. A fatter pipe — a 32-amp cable BMW is just making available, plugged into a 220 volt line — cuts the fill-up time for the 35 kilowatt-hour lithium-ion battery to a mere 4.5 hours. That’s down from the 24 hours it takes with the 12-amp cable that plugs into any 110 volt outlet. Will initially launch a fleet of 500 vehicles through a pilot project involving select private and corporate customers in California, New York and New Jersey. At the end of the lease, cars belonging to the pilot project will be returned to BMW’s engineering fleet, whereupon they will be subjected to comparative tests ahead of full market production, though some will be available for extended lease. The Fisker Karma is an Electric Vehicle with extended range (EVer) luxury sports sedan revealed on 14 January 2008 at the North American International Auto Show. It is the first car from Fisker Automotive, a new auto maker based in Anaheim, California, founded on 5 Sep 2007. Fisker Automotive began production of the Karma in July 2011 with final assembly at Valmet Automotive in Finland. The Karma uses Q-DRIVE plug-in hybrid technology, developed exclusively for Fisker Automotive by Quantum Technologies. A fully-charged Karma burns no fuel for the first 50 miles. Venture further and the gasoline engine turns a generator to charge the lithium ion battery. Once the 50-mile electric range has been exceeded, the car operates as a normal hybrid vehicle. Fisker has issued a recall for the Karma for a battery problem. Autoblog reported thatConsumer Reports had its anonymously purchased Karma break down during calibration tests, before they even had a chance to test-drive it. 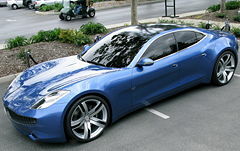 Fisker closed its latest equity financing round at $189 million in June 2010. As well as $115 million secured in Jan 2011 as part of a round kick-started by investment from battery supplier A123 Systems. In May 2010, the Obama administration announced that the Department of Energy and Fisker had finalized the agreement for $528.7 million in low-interest direct loans under the DOE’s Advanced Technology Vehicles Manufacturing (ATVM) program. The loans were meant to help Fisker launch its luxury plug-in hybrid model, the Fisker Karma, and set up manufacturing in Delaware (at an old General Motors plant in Wilmington) for a line of lower-cost plug-in hybrids. In February 2012, Fisker stopped work at its Delaware Project Nina plant and laid off 66 workers, and is renegotiating its $529 million Department of Energy loan amidst news that it has been blocked from accessing the money since May 2011. Idea – From Bright Automotive, Anderson, Indiana, (Wikipedia) A company spun out of Rocky Mountain Institute (RMI). 100-mpg plug-in hybrid electric (PHEV) fleet vehicle achieving breakthroughs in platform efficiency. Each year, corporations and governments purchase hundreds of thousands of light-duty vehicles for their fleets. While these vehicles may get the job done, their performance leaves much to be desired; the utility and comfort are antiquated, and on average, they get less than 15 mpg. 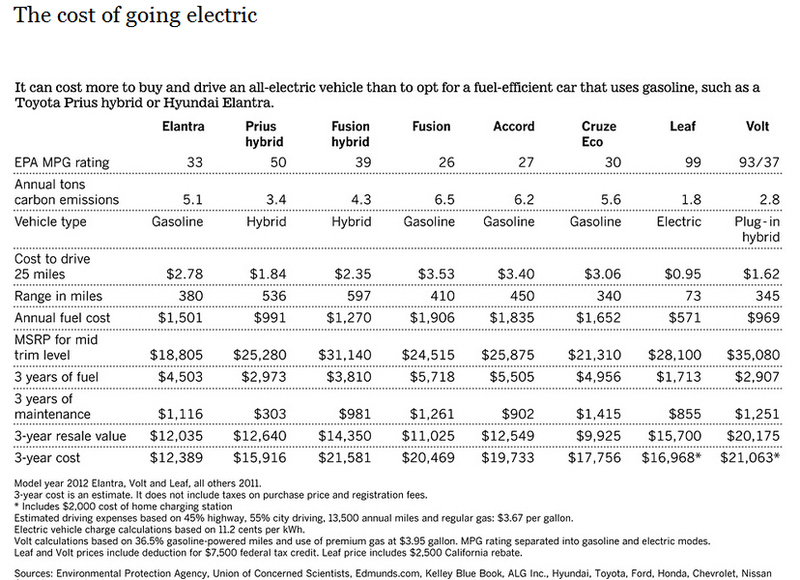 The IDEA saves 10¢ per mile and $6,000 per year in fuel vs. its competitors. The IDEA will save a 250-vehicle fleet company more than $500,000 per year. Offering the right products and services including determining the best process to install 240V plugs in consumers' homes. California Public Utility Commission Policy and Planning Division staff white paper entitled Light-duty vehicle electrification in California: Opportunities and Barriers. May 2009. The Policy and Planning Division developed this paper in order to spot trends, issues, opportunities, and barriers. The CPUC objectives were to ensure that fair and reasonable rates for EVs would be offered, to protect the reliability of the grid, to promote innovation for EV products and services by keeping the various "playing fields" level and open, and to make sure that other critical issues also are being addressed. The CPUC is essentially leading the process of establishing "the rules of the game" for EVs, and since this has never been done before, the results will likely serve as the template for other states and countries going forward. Science Direct - Batteries: Lower cost than gasoline? 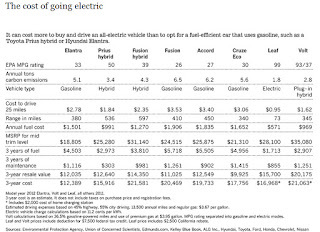 Mathew Werbera, Michael Fischera and Peter V. Schwartz, Cal Poly Physics Department, San Luis Obispo - We compare the lifecycle costs of an electric car to a similar gasoline-powered vehicle under different scenarios of required driving range and cost of gasoline. An electric car is cost competitive for a significant portion of the scenarios: for cars of lower range and for higher gasoline prices. Electric cars with 150 km range are a technologically viable, cost competitive, high performance, high efficiency alternative that can presently suit the vast majority of consumers’ needs. Thanks a lot for that overview. I like how you enumerated the information about PHEV.